I found this interesting and informative post on Reddit earlier. It goes over the numbers behind the risk versus reward system recently introduced in Diablo 3 and further added with the release of the expansion, Reaper of Souls. Above is the difficulty chart, click to enlarge. * Note: It lists two others but the information provided is entirely covered in the graphic above. Using a calculation of adding difficulty percentages together and reward percentages together I have come up with a calculation of risk versus reward. The data is plotted below on a line graph against each difficulty setting. 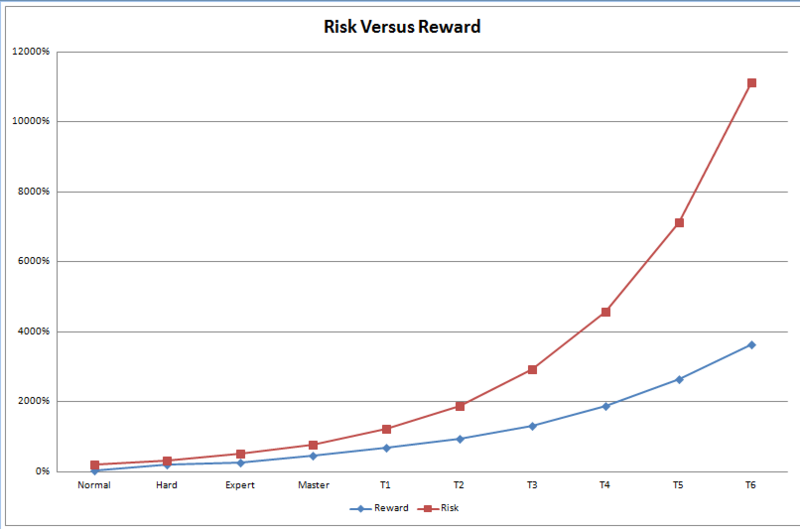 As you can see, the risk increases exponentially compared to reward as difficulty increases. The bonuses not calculated into the equation of reward, though are: Class Set Items drop (level 60+ in T1+), RoS lvl 70 legendary drop (yes or no) and the blood shard drop multiplier. Analysis of this data concludes that if you cannot play through a given difficulty with ease, you should lower the difficulty setting until you can cut through hordes of monsters with ease as the reward is not equal to the risk.